The Department is very excited to be hosting so many distinguished guests and speakers! 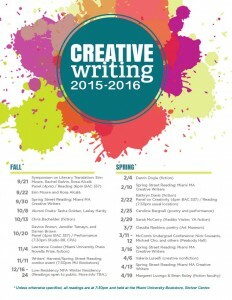 This lovely poster lists all of the events during the year that the Creative Writing Department at Miami hosts, the next event being Chris Bachelder, author of U.S.! and Bear v. Shark, tonight at 7:30 in the MU Bookstore. You may want to get there a bit early, because it’s sure to be a full house. This entry was posted in Uncategorized and tagged Creative Writing Program, poster, reading series, Readings, schedule of events, visiting writer on October 13, 2015 by moorebc2.